Hi there. Hope you have had a great weekend. We've had a quiet one. I've been enjoying reading magazines, books, eating mince pies and watching the new series of The Bridge. Basically just keeping warm and cozy. Embracing Hygge as that temperature has really dropped. We've lots of fun adventures coming up in the next few weeks, so a weekend of doing nothing has been bliss. Anyhoo, here is my round-up of weekly favourites. Eat: On Friday night we made this simple yet super healthy risotto (image 2) made from pearl barley, roasted squash and red pepper. It was delicious, so filling and particularly nice with a big old glass of Rioja. 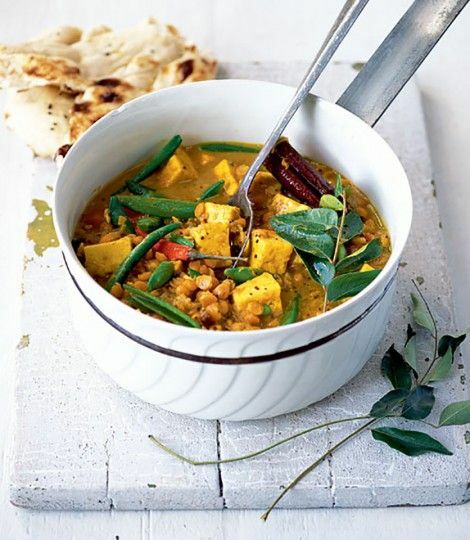 This week we're going to try this split pea and vegetable curry (image 4). And I'm keen to try and make breakfast a little more interesting and exciting. 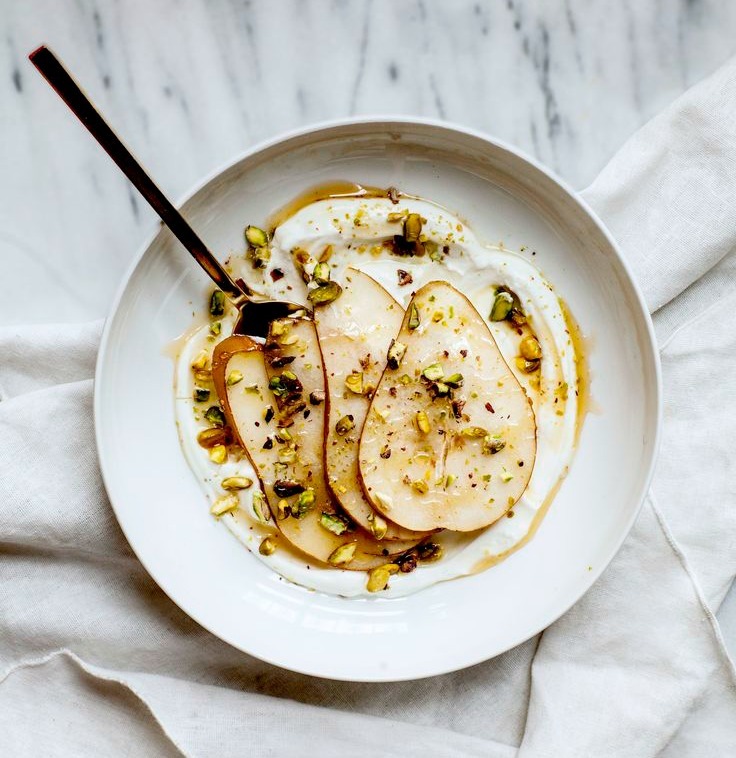 So this combination of pears, honey, pistachios and yoghurt sounds unbelievable. (image 5). Read: I've been devouring the words and pictures of food writers, The Curious Pear. They interview the likes of Green Kitchen Stories, Anna Jones, Yotam Ottolenghi as well as local food producers from all over the world. Absolutely beautiful photography and food that will make you drool. Don't look at it if you are hungry (like I did!). Found: This beautiful folklore inspired bird print over on Etsy by Durido. It's so gorgeous and I love how it would brighten up any space. (image 6). I'm also lusting after these copper tealight holders and handmade candles from Yorkshire company, Essence and Alchemy. (image 1). They would look great on my winter mantelpiece. There is definitely a nip in the air too. So my thoughts are turning to winter clothes. I don't need any jumpers or coats, but I could do with something to warm my head. And I'm really liking the idea of a felt trilby. 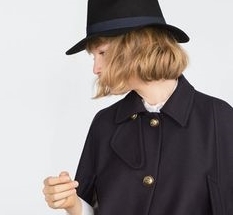 This one from Zara fits the bill at only £22 and navy goes with everything doesn't it? (image 8). Explore: My new Pinterest DIY board. 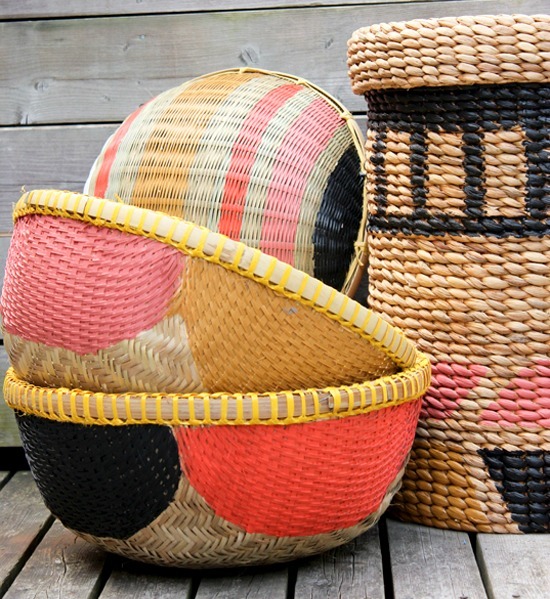 I'm particularly liking these painted baskets by The Marion House Book. I'm going to give these a go in the New Year. I think they would look amazing sat on top of my wardrobe for blanket or towel storage. And I'm still thinking of ways to decorate my home for Christmas. This evergreen garland separating rooms is a great idea for open plan spaces. It would be a nice way to split my dining area from my living room. (image 7).